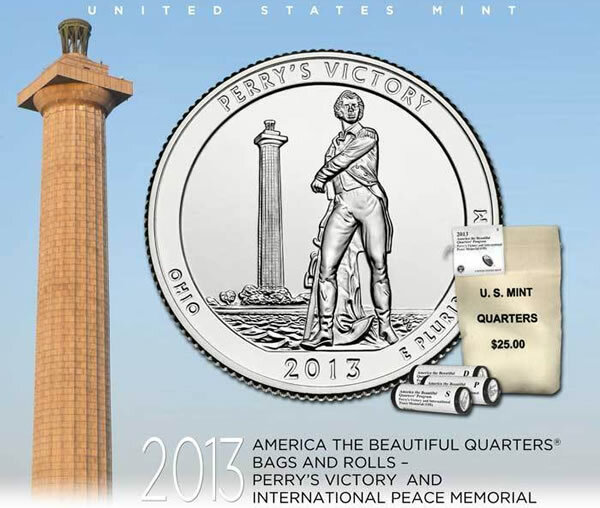 Today, April 1, 2013, the United States Mint introduced numismatic bags and rolls of 2013 Perry’s Victory and International Peace Memorial Quarters. The new products coincide with the quarter’s release into general circulation. This second 2013-dated America the Beautiful Quarter showcases artwork on its reverse that is emblematic of Perry’s Victory and International Peace Memorial in Ohio. Coins in the bags and rolls are in circulation quality, and they are produced at the U.S. Mint facilities at Philadelphia, Denver and San Francisco. As such, a Perry’s Victory quarter will bear the corresponding mint mark of ‘P,’ ‘D’ or ‘S,’ depending on the city of origin. Like all America the Beautiful Quarters, the Perry’s Victory quarter obverse features a portrait by John Flanagan of the first President of the United States, George Washington. The tradition of using this portrait for the quarters’ obverse predates the America the Beautiful Quarters Program. It first appeared on 1932 circulating quarters. The main difference is for the new quarters, the U.S. Mint digitally enhanced the portrait to bring out subtle details of the original model. Surrounding Washington’s portrait are the words: UNITED STATES OF AMERICA, LIBERTY, IN GOD WE TRUST and QUARTER DOLLAR. The reverse or tails side of the Perry’s Victory quarter depicts the statue of Master Commandant Oliver Hazard Perry in the foreground with the Peace Memorial in the distance. Reverse inscriptions read PERRY’S VICTORY, OHIO, 2013 and E PLURIBUS UNUM. Don Everhart, United States Mint Sculptor-Engraver, designed and executed the design. Read the article about 2013 ATB quarter images and their designs. and a 100-coin bag, each with 100 strikes from either of the three locations for $34.95. 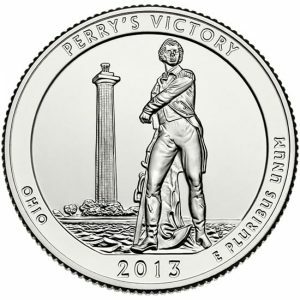 Bags and rolls of 2013 Perry’s Victory quarters may be ordered online or by phone. The United States Mint website and product page is linked here, and its toll-free number is 1-800-USA-MINT (872-6468). All domestic orders will have a standard $4.95 shipping and handling fee. There are no household ordering restrictions and demand will decide quantities of numismatic bags and rolls. Other options for dedicated buyers are the U.S. Mint’s online Subscription Program, described here, and the Bulk Purchase Programs, found here. As mentioned earlier, Perry’s Victory quarters for commerce are also released today via the Federal Reserve Banking System. Coins for commerce are Philadelphia and Denver issues only, and the distribution process through local financial institutions will take time. Local banks are not allowed to order America the Beautiful Quarters by their designs. Hence, it is difficult for coin collectors to find good quality strikes from both Mint facilities in pocket change. Circulation quality San Francisco strikes, it should be noted, can only be acquired from the U.S. Mint initially. Thus, finding one in pocket change has slim odds. 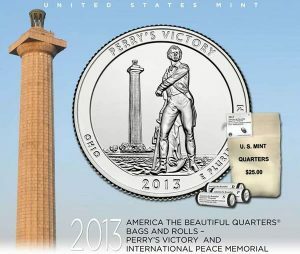 Later this month, the U.S. Mint will host an official release ceremony for Perry’s Victory and International Peace Memorial Quarter. Specifically, it will occur on Saturday, April 20, 2013, at 11:30 a.m. at Perry’s Victory and International Peace Memorial, having an address of 93 Delaware Avenue in Put-in-Bay, Ohio. Preceding the ceremony will be a coin forum, taking place the prior night, April 19, from 5:30 PM to 6:30 PM at the Lake Erie Shores and Islands Welcome Center-West. The address is 770 SE Catawba Road (State Route 53) in Port Clinton, Ohio. Both ceremony and coin forum are open to the public. 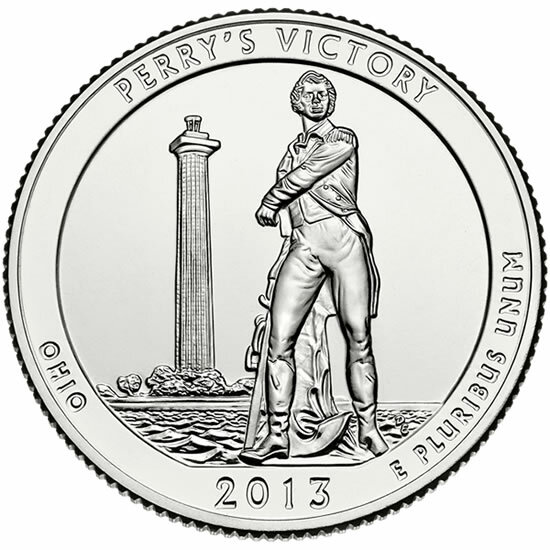 Perry’s Victory quarter marks the 17th strike in the America the Beautiful Quarters Program. Each year, going back to 2010, five new quarter-dollars are released with separate reverse designs, all emblematic of a different national site, until every state and U.S. territory is represented. The last quarter in this program will appear in 2021. Already in 2013, coins for White Mountain National Forest of New Hampshire launched on January 28. Future issues will honor Great Basin National Park in Nevada next June, Fort McHenry National Monument and Historic Shrine in Maryland in August, and Mount Rushmore National Monument in South Dakota in November. More information about upcoming America the Beautiful coins and products is found at this site’s news section about quarters. So just how much is the design, tooling and minting of these new quarters costing the tax payers. This is a beautiful coin!! I have a friend that has one of these quarters that clearly is a misprint. It looks as if the coin was stamped twice, an 8th of an inch apart. Does anyone know what the value of such a coin might be, to the right buyer?.